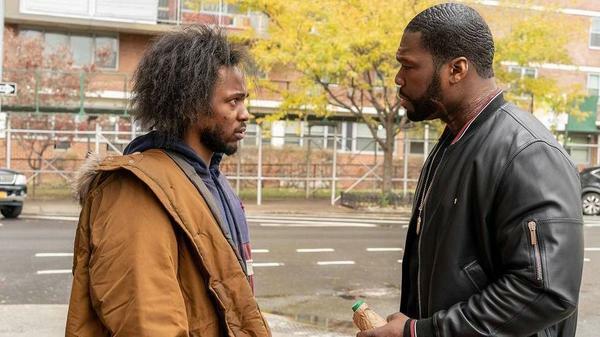 Kendrick Lamar starred opposite 50 Cent in his acting debut on Power. The voice of a generation won't be relegated to one medium. Hip-hop superstar Kendrick Lamar added another notch to his belt last night, as Pulitzer Kenny transformed into Crackhead Kenny for his television series debut: Lamar played a fast-talking, philosophical addict named Laces in the 50 Cent-produced Starz series Power. News of the episode and Lamar's performance began trending on social media even before it aired. In scenes opposite 50 Cent's character Kanan, Lamar looked committed to the role; his hair wild, clothes unkempt and full of visual tics. And his character, Laces, was as endearing and emotionally unstable as Lamar's most soul-probing work. Billed by Starz as Lamar's scripted TV acting debut, it's wasn't a far departure for an artist whose musical vision has always been cinematic in scope. Lamar's role on Power resulted from a conversation between he and 50 Cent. "He and Kendrick ... were hanging out and Kendrick said, 'I'd really like to be on the show,'" series producer Courtney Kemp told the Associated Press. Lamar's level of preparation for the role also impressed Kemp. "He's very kind of quiet and thorough and methodical. He had prepared so much. He was ready," she said. "He's really gifted, tremendously gifted. I mean it's a total transformation. It is not a version of Kendrick Lamar that you've ever seen before." For fans of Lamar, his acting chops should come as no surprise. He's arguably the best storyteller active in rap today, with a discography that hinges on the epic narrative arc. His flair for the dramatic, both in front of and behind the camera, has been a staple of his music videos for years. Together with Top Dawg Entertainment president Dave Free, Lamar has crafted a compelling visual language within the medium — the videos they've conceptualized and co-directed (as The Lil Homies) alongside auteurs like Dave Meyers are some of the most provocative in contemporary pop. In these music videos, Lamar is doing much more than portraying outsize versions of himself. He's a character actor, embodying competing aspects of his own persona, or stepping into various roles outside of himself as the music requires. He's a pimp to the absurdist extreme, complete with Uncle Sam get-up, in "For Free? (Interlude)"; a tortured soul haunted by suicidal ideations and a predilection for self-medication in "God Is Gangsta"; an egomaniac of seismic proportions in "HUMBLE." In "D.N.A.," he stars opposite Don Cheadle, and holds his own as Rihanna's savage love interest in "LOYALTY." Several years ago, in a small music venue in Atlanta, I witnessed Lamar perform live for the first time. It was some time after the release of his studio debut Section .80 — a thematic LP dedicated to children of the crack era. About midway through his performance, he stopped the music and proceeded to reenact an extended scene from his living room of his childhood home in Compton, Calif. Lamar portrayed both of his parents, arguing back in forth in colorful fashion. It ended up being a preview of the skits that would tie together his major-label debut good kid, m.A.A.d. city. His performance that night also foreshadowed an emerging artist whose sizable talent would not be contained by music alone.